And a Merry Christmas to YOU, house! Remember my kitchen? What little you’ve seen of it? Well, not exactly. We have a new stove. But otherwise, this picture is pretty representative of the overall feel of my kitchen. 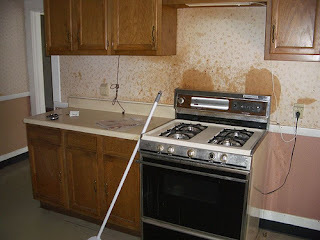 That feel is “unbelievably ugly, and with very little counter space.” I hate the kitchen with a violent, violent passion, and our original home improvement plans called for gutting and replacing the kitchen immediately after buying the house, even before doing the bathroom. 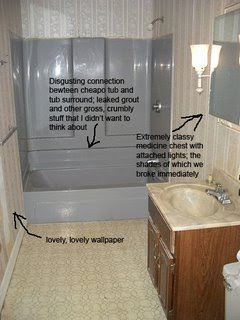 My logic was that, although the old bathroom was equally hideous and gross, we spend much more time in the kitchen and could just shut the bathroom door to hide it. the next thing we new, we were gutting the bathroom. As this ordeal has already been well-documented, I will spare you the details now. Still in all, I am actually really glad that we did the bathroom before the kitchen. 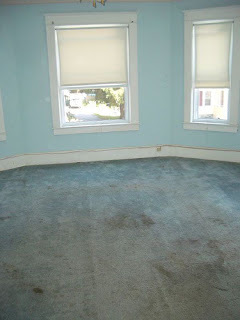 Had we started with the kitchen, it would not have occurred to us to switch the positions of the tub and laundry hookups, and we ended up with a much better layout than we started with. And, as an added bonus, any work we eventually do on the kitchen will require no plumbing, because the plumbing is done. DONE. But you know what is not done? The kitchen walls. 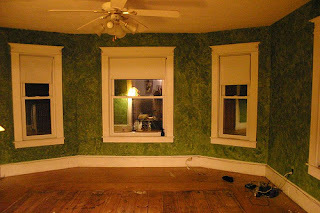 We haven’t even attempted to paint them because when we tried peeling off a little bit of the wallpaper, huge chunks of plaster came with it, and we figured we’d just not bother since we were going to replace the walls anyway. At first we were going to replace the walls last summer, when we were finished with the bathroom which was only going to take one month. Ha ha ha ha ha ha ha ha ha! Weren’t we just adorable? Right. So then we were going to replace the walls this fall, but we didn’t get organized in time, and our contractor (because this time we are hiring a contractor) was booked up until January. But that was fine! We could wait until January. So we gave him a deposit and got on the schedule for January, 2008. And then, on the Wednesday before Christmas, our roof started leaking. On the Saturday before Christmas, the roofers came to clean the snow off and take a look. We were hoping and praying that the leak was just due to an “ice dam,” and that maybe all we’d need was a small patch, but no such luck. Nope! We need a whole new roof! Well. At first we thought we’d have to cancel the kitchen renovation, but as it turns out, we are miraculously still going to be able to do it. We just have to wait until March. We only have to wait until Wednesday for the roof, though, the roof that was originally scheduled for today but had to be postponed because December 2007 decided that it was going to leave its mark on history in New England and it snowed for the hundredth time this month today. While I love snow as much as the next northerner, we are done. Done! We get it, December, 2007. You are almighty. Now go away. 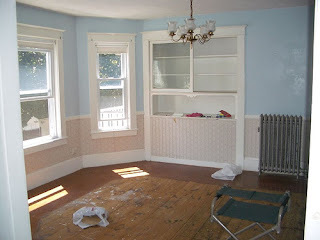 *I have since learned that you should always, always, paint the woodwork and the walls AT THE SAME TIME. 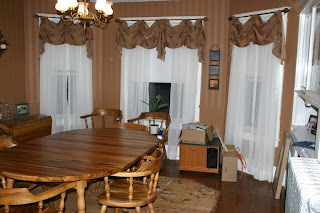 Under no circumstances should you say, “Oh, we’ll just do the woodwork in these rooms all at once after we finish picking out all the colors.” We are still working on the trim in these two rooms, and we painted the walls two years ago.